Welcome to the heritage institute of STUDY CAMPUS. We take pride in our work of instilling students with confidence and success in their journey of realizing their dream to crack the CLAT examination. The CLAT or Common Law Admission Test is perhaps one of the most competitive exams conducted in pan India. This acts as a pass ticket for all undergraduate and postgraduate aspirants who see their future in the realms of Law and Law firms. Thus, for cracking the exam one needs a very scientifically and carefully planned approach to question solving. 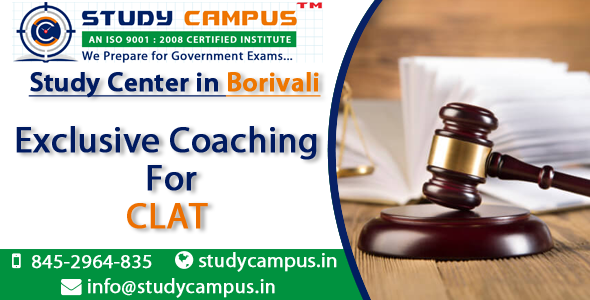 For this, our CLAT Coaching in Borivali has made the perfect plan for you. What makes us the best choice amongst all? Our institute has the highest rate of success across the whole nation. We have got the best of the amenities and facilities for the perfect guidance of our students. The best of the teaching faculty that takes care of student’s every doubt. Our scientifically crafted curriculum that is a sure shot way to the success grounds of the exam. The weekly tests that evaluate the student’s growth. The online tests and materials that are made accessible for round the clock. Students not only from Borivali but also from Kandivali East are enrolled with us. So without wasting time, give your career the height that it deserves today. Because to be the best, you need the best!